It's hoped that the new Costco will bring jobs to Bayonne. Costco Wholesale warehouse will officially open on March 7 when the company and Bayonne city officials will hold a ribbon-cutting for the 148,000-square-foot warehouse and gas station on Route 440 between Goldsborough Drive and 40th Street, according to a Costco representative. The project was first announced in November of 2017; the warehouse and gas station were constructed over the course of a year. Currently, construction crews are working on the interior of the warehouse. Gas station pumps are installed, but workers are still excavating the ground beneath. Costco warehouses often have gas stations; this one seems especially well placed along a major traffic corridor through which Staten Island commuters travel. The wholesale retailer is one of many developments planned for the former Military Ocean Terminal Base and the surrounding area, including a ferry terminal and thousands of units of apartments to the east of the site. It will compete with nearby Walmart. Costco purchases half the world’s supply of cashews (which are sold in a square container to save shipping space). It’s been selling $1.50 hot dogs at its grill since 1985. Every year, the company sells more than 100 million pounds of fresh ground beef and 37 million five-dollar rotisserie chickens. A Costco in Lancaster, Pennsylvania, designated horse and buggy parking spaces for the Amish. The company was founded in 1976 after its founder split from the retail warehouse club, Price Club, which would merge with Costco in 1993. Costco barely makes a profit from the stuff it sells. It makes money from memberships, which cost $60 per year for a basic membership and $120 per year for a 2-percent cash-back card. All customers must be members. “I’m sure we’ll be eating those [rotisserie] chickens.” — Suzanne T.
City leaders often support big companies coming to Bayonne, claiming that jobs at those companies will be a boon to the local economy. Costco, for its part, is consistently ranked among the best large employers. The company is the second largest worldwide retailer after Walmart, with 143,000 employees, which it pays more per hour than its competitors, and provides health insurance to nearly 90 percent, including many part-time workers. Costco ranks among the likes of Google, Facebook, Adobe, and USAA in employee satisfaction surveys from Glassdoor. At the nearby South Cove Commons, the Alessi Company is clearing the way for an 80-unit residential building and office space along with a Hilton Garden hotel that will overlook the Bayonne Golf Club. The hotel is touted as a needed amenity for the Bayonne Cruise Port. South Cove Commons is currently home to Frank Theatres; Stop & Shop; Otaiko Hibachi & Sushi Lounge; and T.J. Maxx. 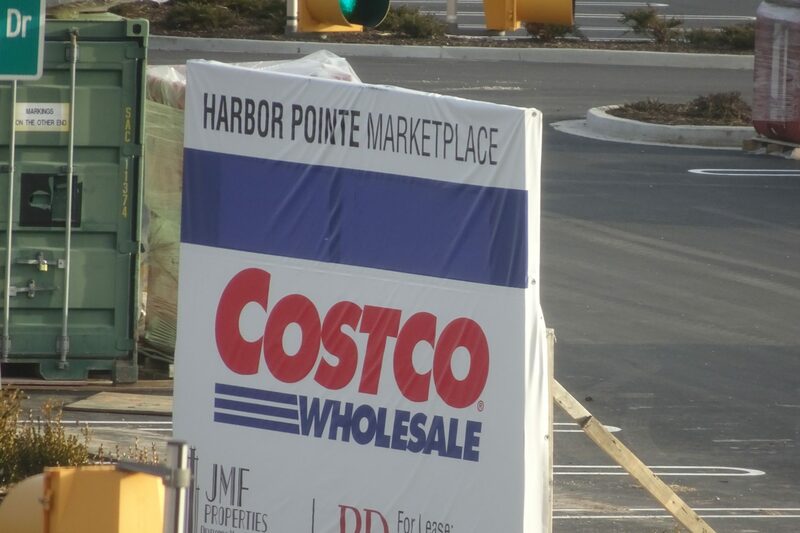 An improved shopping center with a Costco may complement the many planned residential developments on MOTBY, along with the Harbor Pointe apartment complex already on the base.